Updated 11/30/08. Thanks to Scott A. Hartley, Josh Weis, Joe Klapkowski, Daniel Chazin, Jaap van Dorp, and the Hudson Rail Road list members who have contributed. It would have been impossible without Scott's definitive 1993 article in Trains. This roster is final MNR/CDOT number followed by first New Haven numbers and Penn Central/Conrail numbers. CDOT locomotives are in New Haven/McGinnis scheme. 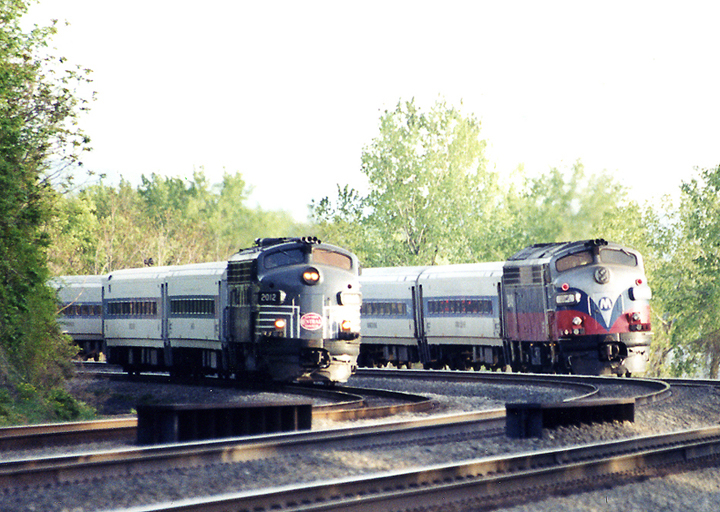 Also included are the 3 LIRR FL9ACs. LIRR 301 NH 2000, PC/CR 5000, MNR 2025 FL9AC Scrapped Rebuilt by ABB Republic 1991, retired 1999 when replaced by DE30ACs, 600 V AC, scrapped at Croton East by FICX in 2005. Fueltank/electrical components and truck parts missing after it fell in turntable pit at LIRR. MNR 2017 NH 2045, PC/CR 5045 FL9 Retired to M&E Purchased by SIXX Leasing - shipped to M&E in > Morristown, to be used as parts source, still in Cedar > Knolls, NJ as on 02/2007, current location/condition > unknown. MNR 2029 NH 2019, PC/CR 5019 FL9 Dead To Adirondack Scenic Railroad 9/14/02. Scrapped in Rome, NY.